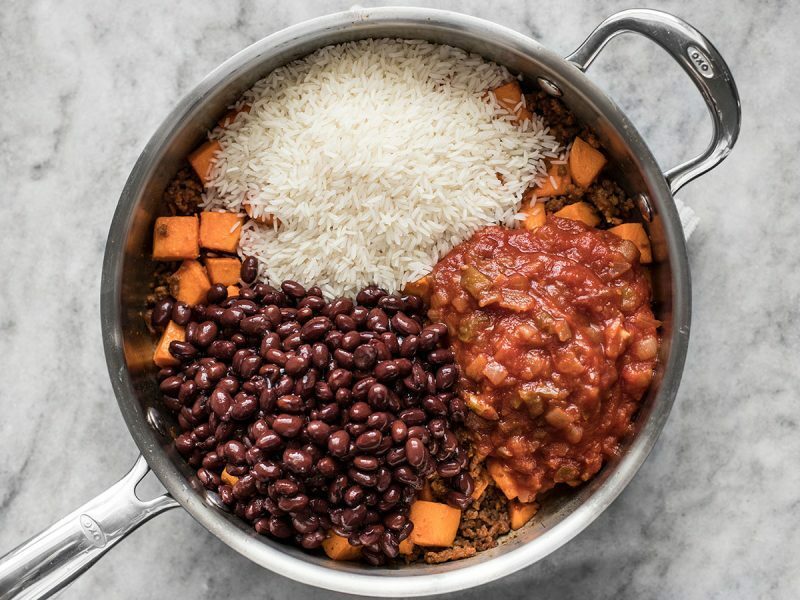 I’m loving these one skillet meals not only because they’re so easy to make, but because they’re so easy to eat. 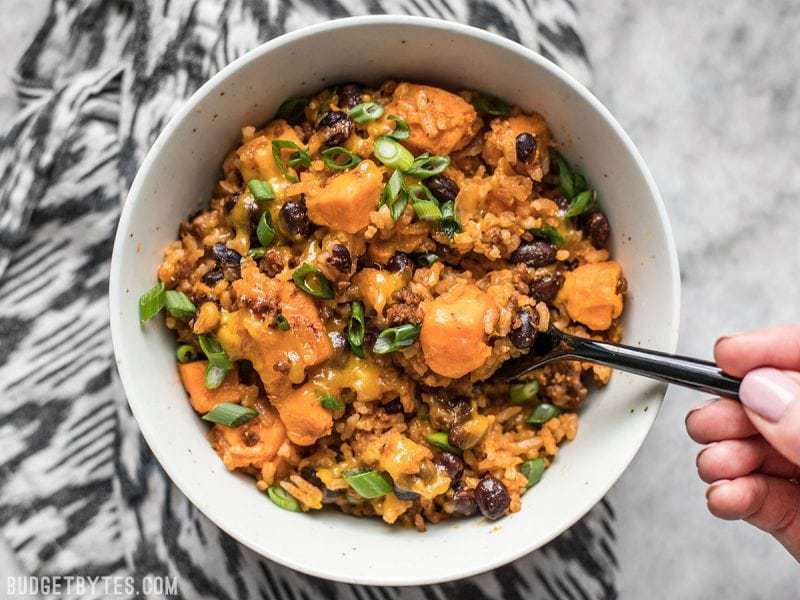 Instead of filling my plate with a main dish and a couple of sides, This Chorizo Sweet Potato Skillet has everything I need in one bowl. Carbs, fiber, protein, vegetables, and CHEESE. Ha, just kidding about needing the cheese (not kidding). Anyway. 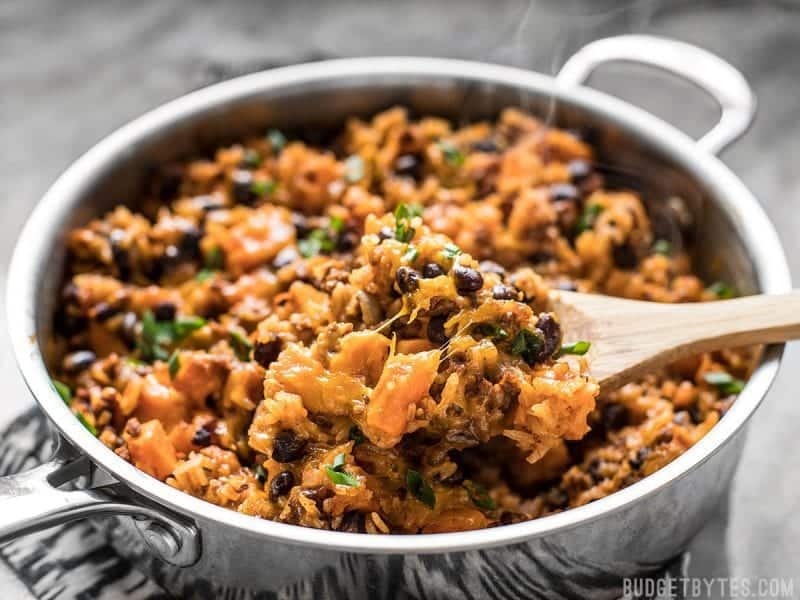 Since making my Chorizo & Sweet Potato Enchiladas over three years ago, I’ve been in love with the sweet and spicy combo of chorizo and sweet potatoes. 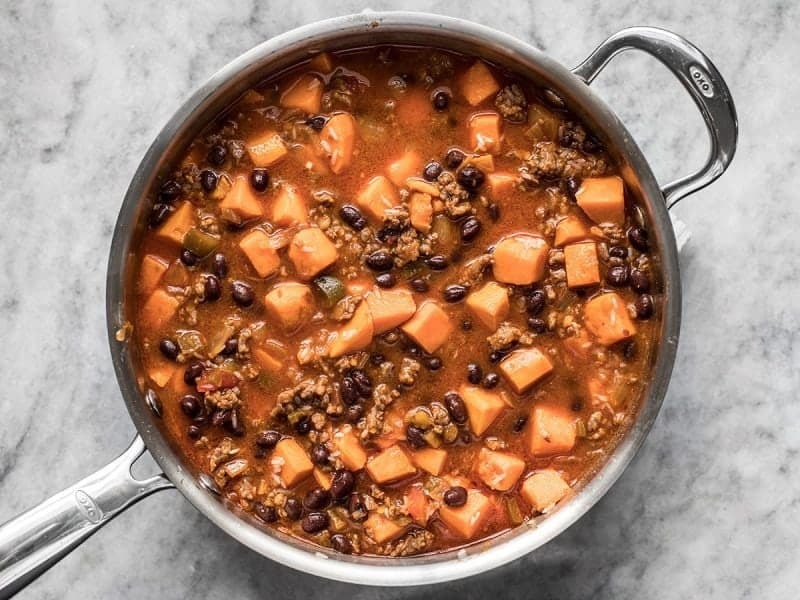 Spicy Mexican Chorizo and the subtle sweetness of sweet potatoes go so incredibly well together and I just can’t get enough of it. 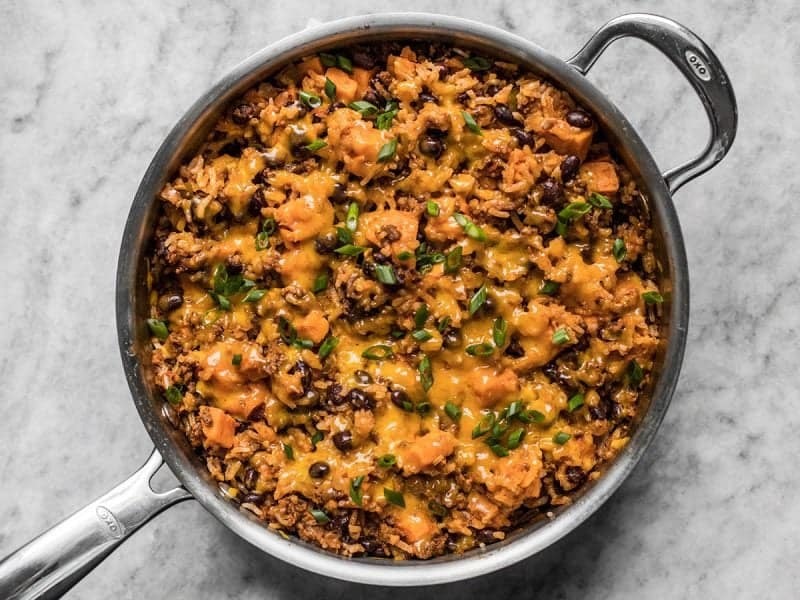 So, for this skillet meal I paired up the famous flavor duo and cooked them together with rice, black beans, and salsa (the same method used for the Southwest Chicken Skillet). I don’t know if there’s an easier way to pack in so much flavor with so little effort. And, BONUS, this one freezes super duper well, so it’s a great candidate for stocking your freezer with ready to reheat meals! 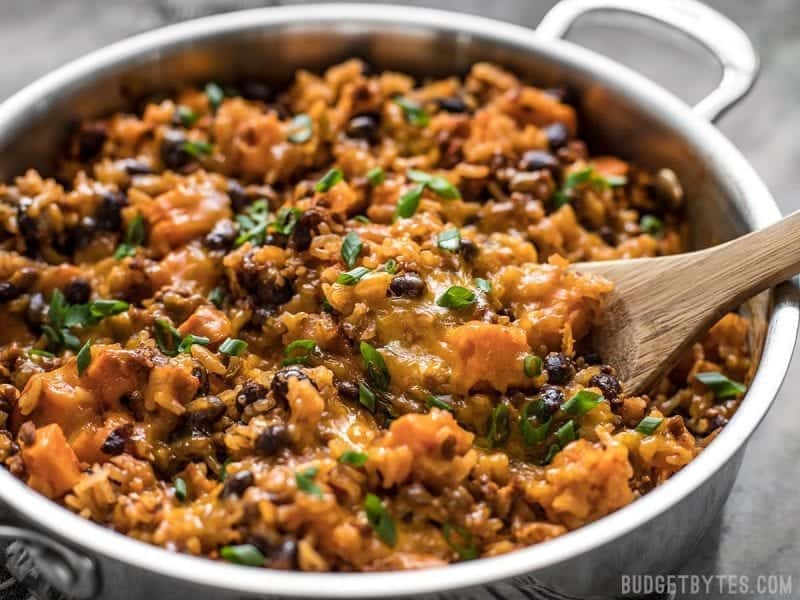 It only takes one skillet and a few ingredients to make this incredibly flavorful and filling Chorizo Sweet Potato Skillet. Peel and dice the sweet potato into 1/2 to 3/4 inch cubes (size matters, make them small). Sauté the sweet potato cubes in a large skillet with olive oil over medium heat for about 5 minutes, or until the sweet potatoes have softened about half way through (they'll cook more later). 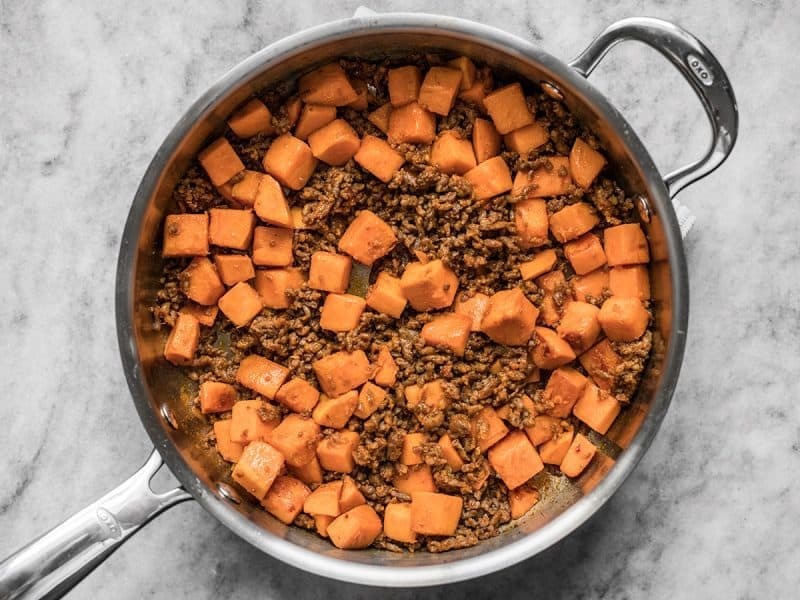 Add the chorizo to the skillet (squeeze it out of its casing if it came in links) with the sweet potatoes. Sauté the chorizo and sweet potatoes together, breaking the chorizo up into small pieces as it browns. Once the chorizo is fully browned, pour off any excess grease if needed. Rinse and drain the black beans. Add the beans, salsa, and uncooked rice to the skillet. Stir them into the sweet potatoes and chorizo until everything is well combined. Add the chicken broth, stir briefly, then place a lid on the skillet. Allow the contents of the skillet to come up to a boil, then turn the heat down to low. Let the skillet simmer on low for 30 minutes. Make sure it is simmering the whole time (you should be able to hear it quietly simmer away). If it is not, turn the heat up slightly. After 30 minutes the rice should be tender and have absorbed all of the liquid. 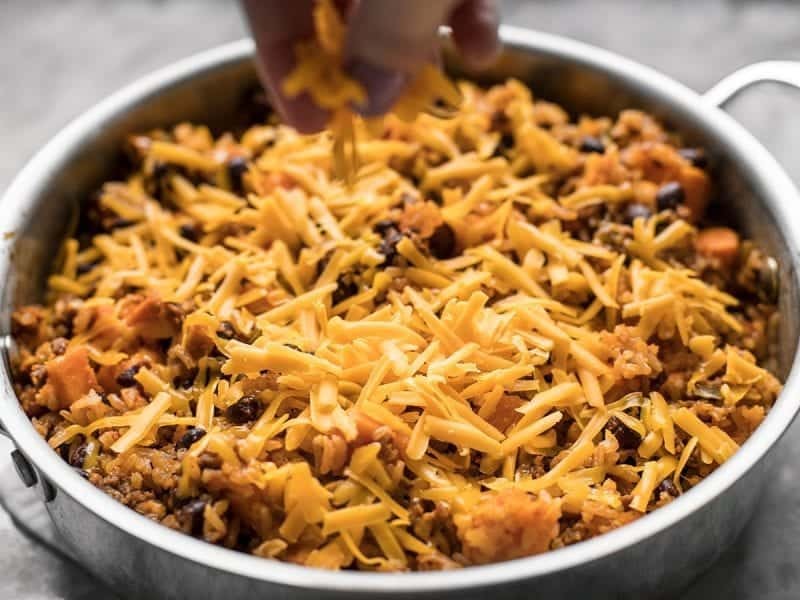 Turn off the heat, fluff the mixture, sprinkle the cheese on top, then return the lid to trap the residual heat and help the cheese melt. Slice the green onions while the cheese is melting, then sprinkle them on top and serve. 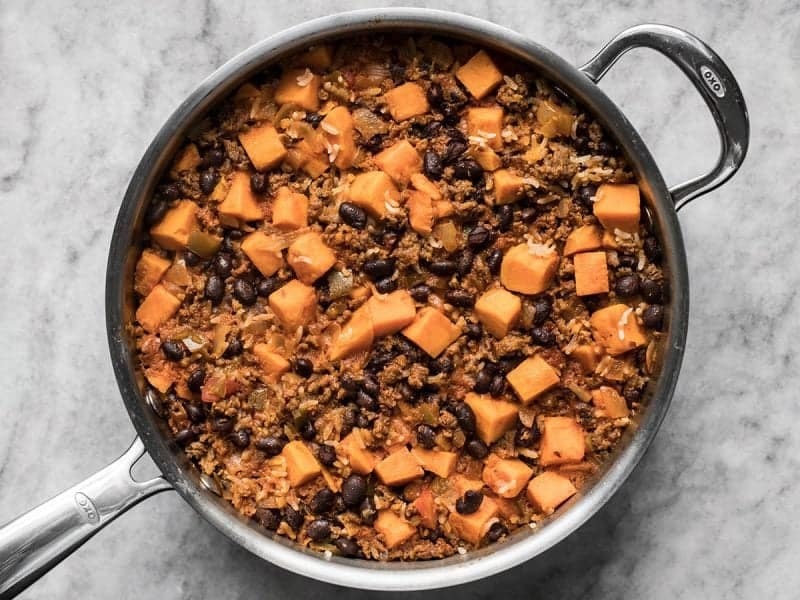 You can use either green or red salsa for this dish, but I prefer green to compliment the sweet potatoes and chorizo. First, peel and cut the sweet potato into 1/2-3/4 inch cubes. 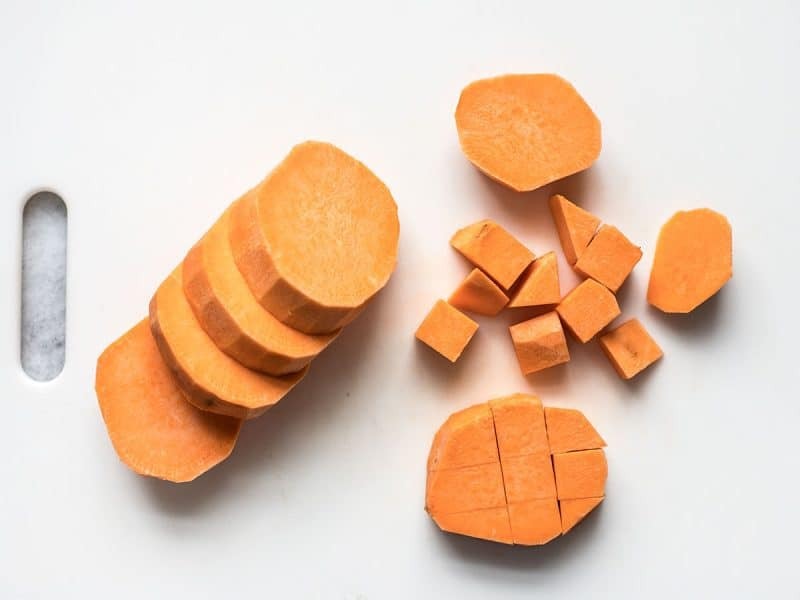 The easiest way to do this is to first peel the sweet potato, cut the sweet potato into rounds, then cut the rounds into cubes. If a few of your rounds are about the same size, you can stack them before cutting them crosswise into cubes. Making the cubes too big will prevent them from cooking through completely, so make sure not to go any larger than about 3/4 inch. 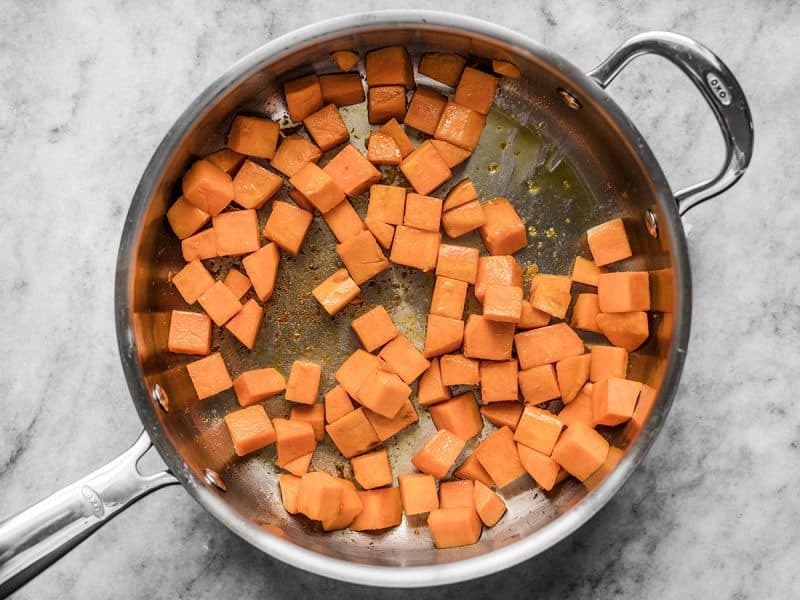 Sauté the sweet potato cubes in a large skillet with 1 Tbsp olive oil over medium heat for about five minutes. You want them to cook about half way through at this point. You’ll notice that they turn a little bit darker and slightly translucent as they begin to soften. This is the type of chorizo I use. I only used 1/2 lb. for the entire recipe! 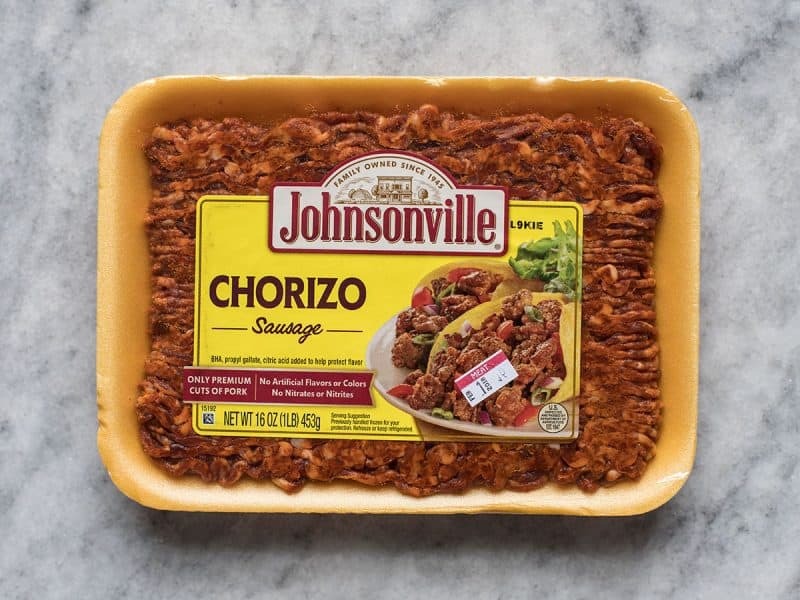 Johnsonville is a large national brand and is available in most major super markets. It’s basically just pork sausage seasoned with Mexican spices. If buying another brand, make sure to check the ingredients and package well because not all chorizo is created equal (I bought some in a “tube” once and it was VERY fatty and not very pleasant). If your chorizo comes in links, simply squeeze the ground meat out of the casing. Add the chorizo to the skillet and continue to sauté until the chorizo is fully browned. If your chorizo has let off a lot of grease, you may want to drain it from the skillet at this point (mine did not). Next add one cup of your favorite salsa, one 15-oz. can of black beans (rinsed and drained), and one cup uncooked long grain white rice. You can use either green or red salsa, they both work great! Now stir these all together with the chorizo and sweet potatoes until everything is evenly mixed. Lastly, add 1 3/4 cup chicken broth to the skillet. Give it a quick stir. Place the lid on the skillet and allow it to come up to a boil. Once it reaches a boil, turn the heat down to low and let it simmer, with the lid on, for 30 minutes. Make sure you can hear it simmering the whole time. Every range will have its “sweet spot” heat setting where the skillet will be simmering, but not so hot that the bottom scorches. Mine is just slightly above the low setting. Using a thick, heavy skillet will help it to cook thoroughly and evenly, too. (This is what it looks like AFTER simmering.) After 30 minutes, the rice should be tender and all of the liquid absorbed. If it isn’t, cover it back up and let it go for another 5-10 minutes. Like I said, every skillet/range is different. If the heat was set too low, it will take just a bit longer. If it was too high, it may be sticking to the bottom of the skillet. 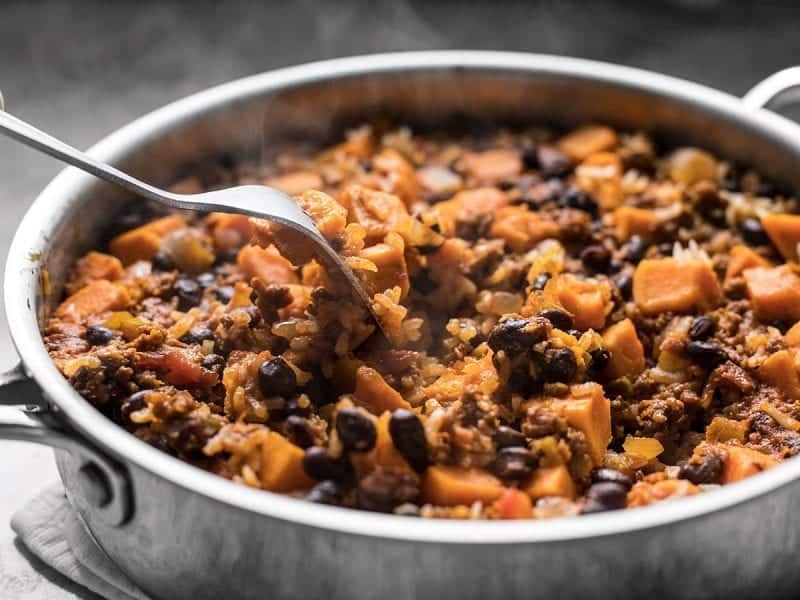 Once the rice is tender and it has absorbed all the liquid, turn off the heat and fluff it up with a fork to mix the ingredients back together. Sprinkle the shredded cheese on top, then cover it back up with the lid. This will trap the residual heat and melt the cheese. Slice the green onions while the cheese is melting, then sprinkle them on top. 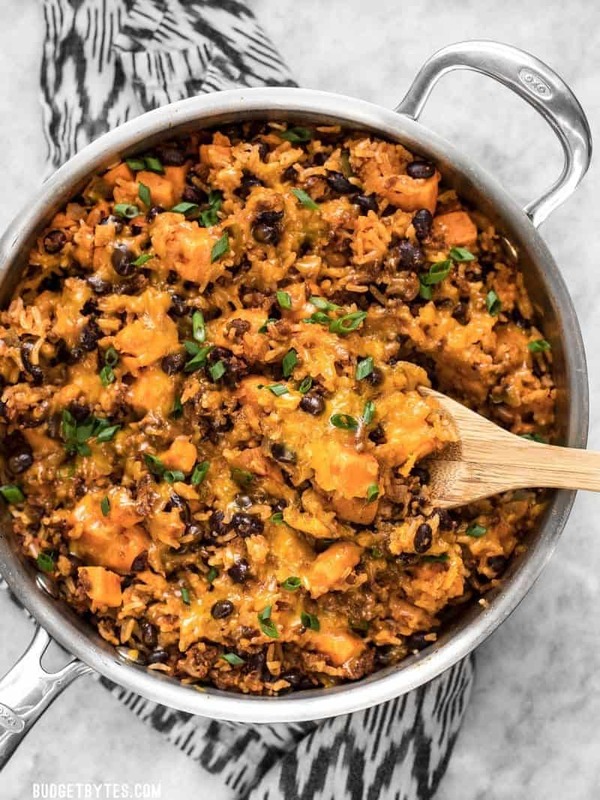 Boxed skillet meals ain’t got nuthin’ on this Chorizo Sweet Potato Skillet! Oh man, I already want to make a second batch! Budget bytes saves the day again! 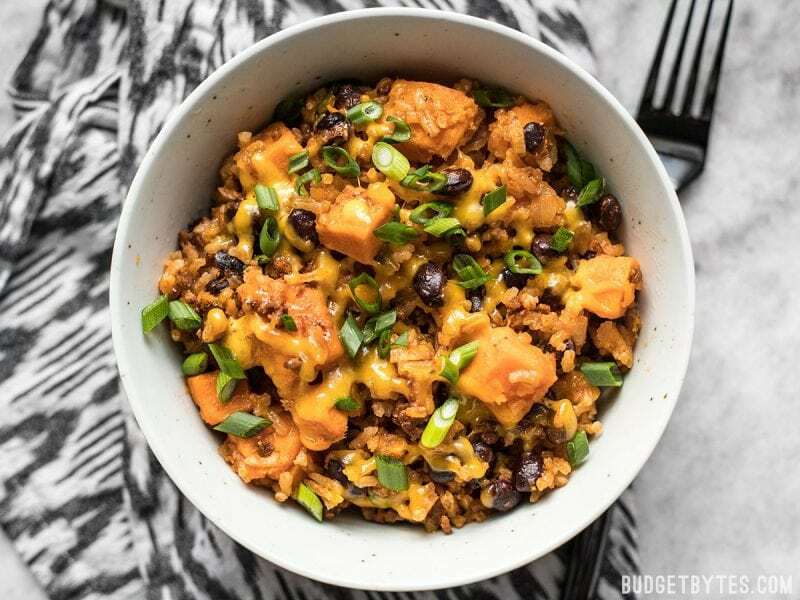 This is hands down our favorite quick, delicious weeknight meal! I was wondering if you’d consider adding nutrition facts for the calorie counters among us? I’m sorry, I don’t have a reliable source for the nutrition information. The calculators and databases that most sites use are rough estimates at best, and can be grossly inaccurate at worst, so I don’t feel comfortable posting numbers that I can’t verify. Delicious, will make again! I used spicy Italian sausage since I couldn’t find chorizo, and used the whole jar of salsa. My rice also needed a bit more water than the recipe called for. Yumm, looking forward to the leftovers. Delicious! Tried this for the first time last week and I cannot get enough of it. Some of my rice seemed ‘crunchy’ – I’m unsure if that’s overcooked or under-cooked. Any input on what this might have been and how to correct it? I would definitely make this again if I could figure out the crunchy rice issue. It sounds like some of it was undercooked. Usually that is due to uneven heating, which can be a symptom of poor quality cookware that doesn’t conduct heat well. So try to use cookware that has a nice thick bottom that will radiate heat evenly. OR, you can try cooking a tad bit longer to see if those last few grains absorb the residual moisture and soften up. Also, try letting it sit with the heat off for a bit after it cooks. Sometimes that helps the steam absorb more into the rice and it kind of “finishes” cooking as it sits with the heat off.